Diagnosing a Port's Ailments with GPS. Three Easy Remedies. Accurate measurement and analysis of turn time from GPS data provides remarkable insight into causes of delay, and solutions. 2014 11 13 | Highlighted and clarified three solutions. Re-titled. In the ports of Vancouver, Oakland, Los Angeles-Long Beach and New York-New Jersey, turn time disputes have led to strikes or otherwise attracted considerable attention this past year. They're the latest developments in an intense and long standing conflict, mostly between truckers (formally, licensed motor carriers or LMCs) and marine terminal operators (MTOs). GPS is a valuable new data resource that's being used to establish the facts of turn time: is it as bad as the truckers claim? That’s neither the full extent of the problem, nor the full value of GPS data. Turn time is a problem of national significance. The Tioga Group valuated annual U.S. losses at $300 million. Port inefficiency delays economic activity, ties up critical freight assets, creates security vulnerabilities, and has environmental and community impacts. The parties to the problem are not just LMCs and MTOs, but the entire port freight industry. With multiple competing interests, and arguments and counter-arguments this way and that, key issues of logistical efficiency tend to get obfuscated. When properly analyzed and interpreted, good data cuts through the fog, clarifies issues and builds consensus. The causes of delay, and remedies, become crystal clear. Live congestion reports help truckers steer clear of long queues. In this article I'm going to show how that's done. In the twin ports of Los Angeles and Long Beach (together known as San Pedro), turn time has worsened considerably over the past 4 years. GPS data build a compelling case that three straightforward, cost-neutral policy adjustments — (1) staggering longshore labor breaks, (2) ramping down the daytime Traffic Mitigation Fee (TMF) over a few hours rather than all at once, and (3) moving the night shift forward by an hour — would reduce turn time by perhaps 20%. To begin, let's look at the GPS answer to the basic question: how bad is turn time? LMCs have struggled to find the objective evidence to support their claim that turn time is a problem. In the past, MTOs’ gate entry and exit timestamps were the only hard evidence available. While LMCs complained that turn times were in the range of 2-3 hours, MTO data indicated that in-terminal time averaged 30 minutes. LMCs were certain that these numbers were dishonestly manipulated. Inevitably, accusations flew in both directions. When it became possible to measure turn time from GPS, LMCs found they had a trump card. Now they had a data source of their own. However, a series of GPS-based studies, most recently a program commissioned and closely controlled by the Harbor Trucking Association in Los Angeles, found turn time averaging an hour: about 20 minutes in the queue to get in, and 40 minutes inside the terminal, corroborating the MTO data. All these numbers are rounded for clarity. We're not splitting hairs over 10-20 minutes; the argument is about 1 hour versus 2 or 3 hours. In statistical terms, turn time doesn’t have a “normal distribution” or bell curve, like averages we're familiar with, e.g. marks on an algebra test. Turn time is heavily skewed, with a long tail on the right (Figure 1). So we can't quote a mean and standard deviation and close the case. We need to examine the data patterns carefully and find other statistics. Many visits are short. The most likely visit duration (the mode) is about 30 minutes. Some visits are exceedingly long: 2 hours, even 8 hours. Visits over 2 hours were 14% of all trips in 2011. They’re 20-25% now, 40-50% at some terminals in some months, and 60% port-wide at certain hours of the day. Let’s be clear: MTOs are not exclusively to blame for this. If a trucker were to schedule his trips around the median, half of his deliveries would be late. When planning a 75-mile run, he needs a near-certainty of making his delivery window, which means budgeting in grace time. Working out a range of standard allowances commonly used in transportation, it turns out that the time a trucker must budget for a port visit to meet a deadline is 3-4 hours. In 2010 that budget was 2-3 hours, precisely what the truckers' impression of turn time was. The MTOs are right: their numbers are legitimate, the average is an hour. The LMCs are right too: there is a turn time problem. Figure 1. The distribution of turn time is heavily skewed and tailed. Standard statistics like mean and median are not significant points on the curve, and are of little value. Although the average is around one hour, because of the high prevalence of long delays, the time a trucker must budget for a port trip is 3-4 hours. The data behind these statistics are drawn from METRIS, a product/service package that we deployed in Los Angeles under a USDOT Research and Innovative Technology Administration project in 2007, and later commercialized. METRIS GPS tracking equipment polls location 10 times more frequently than other commercial instruments. It's backed by sophisticated, purpose-built, error-proof analytical software that calculates queue and in-terminal dwell with near-100% certainty. The rigorous integrity checking of this system is unmatched by the off-the-shelf algorithms used by other consultants who analyze turn time. For example, METRIS detects the worst instance of operational confusion: a truck that makes repeated entries and exits before completing or abandoning a transaction. They constitute one trip, not several; those episodes in particular need to be documented, diagnosed and remedied. METRIS records for San Pedro go back 5 years, covering thousands of port transactions each month. No other data resource approaches it. METRIS also offers LiveQ, a unique feed of queue information in real time. Unlike one other service at a Canadian port that clocks a truck's time in the queue after it enters the terminal, METRIS LiveQ measures length, dwell, speed of progress and trending while trucks are still in line. There are caveats on GPS-derived statistics, that should be clear. Most important, it is impossible to discern the motive of a driver who intentionally arrives early and lines up behind a closed gate to avoid a congestion fee, to get a good spot in the queue, to take a chance on a quick entry, to grab a bite, or to kill time before an appointment. None of this behavior is unethical, but it does inflate turn time considerably, and because multiple motives and effects are intermixed there is no way to disaggregate them. The only reasonable way to deal with this is to declare the limitations and to interpret the numbers accordingly. METRIS offers a 5-year comparative turn time history for any container terminal in LA/LB. Terminals differ considerably in performance: a factor of 2× or 3× separates the fastest and slowest each month. On the surface, that's good reason to pressure low-end terminals into making the investments required to improve productivity, by shifting business to better MTOs. It's not that easy. Aside from market realities of price/service differentiation, differences in the size of vessels that call, and other business model variables, the difficulty is that performance is impossible to predict in a monthly timeframe. It fluctuates (Figure 2). A terminal can have entire quarters of long turn times, followed by cycles of improvement and relapse. Every terminal experiences this from time to time. The best MTOs — one, maybe two, maybe three — are consistent. It is possible to discern a second and third tier, but they trade positions regularly on the metrics that matter. Rating MTOs based on data over some years is reasonable. Over months it is not. Figure 2. It's not easy to give MTOs a grade report when their performance varies like this. The graph shows one measure of performance traced over two years, for each terminal. A smoothing function has been applied to each curve to compensate for uncertainty due to sampling. METRIS analysis and consulting helps MTOs, LMCs, BCOs and ports achieve consensus. The issues covered above are generic, applicable to any port. Individual ports have their own unique patterns of turn time variation, that act as baselines that facilitate or constrain the performance of their terminals. We illustrate this with the example of San Pedro. Transaction-specific delay, such as a typo on the container number in a document: usually human error that may originate with any party in the supply chain. LMCs have been keen on highlighting differences among terminals, item  above. But changing a terminal’s performance is expensive, and unlikely to be achieved overnight. Let's shift focus to item : what's common among terminals, the role of port-wide policies in the high baseline. Variations by time of day, caused by port policies and practices, are at least as wide as the variations among terminals. The productivity improvements sought could cost little or nothing, and the data to support this are unambiguous. The principal cause of delay is the labor breaks at terminals, one hour each at noon, 17:00 and 22:00. The enormous waves in Figure 3 leave no doubt about how this works: turn time doubles for trucks arriving in the hour before the break, and the backlog of trucks delayed inside and outside the terminal takes two hours to clear completely. The 17:00-18:00 break coincides with the congestion build-up at the start of the fee-free shift described under the next heading. Queue length can reach over a mile and takes more than an hour to dissipate. Figure 3. Enormous peaks in turn time show the impact of longshore breaks that shut down most terminals entirely, 3 times a day. Some terminals do admit some trucks, if not the peaks would be higher. The daily profile also shows the relative inefficiency of night operations, particularly 19:00 and 20:00 compared with 09:00, possibly because of the huge TMF-related backlog. Mouse-over the figure for an idealized but achievable profile. Given that the demand for service at 17:00 is several times greater than at 02:00, a solution is to move the entire night shift forward an hour, from 18:00-03:00 at present to 17:00-02:00. That would keep the traffic moving at 17:00 and ease congestion throughout the night shift, when turn times are far greater than during the day. Breaks at noon and 22:00 should clearly be staggered. Some terminals do admit and service some trucks during some breaks, yet this continues to be the primary productivity problem at the ports. The Traffic Mitigation Fee (TMF) in San Pedro is a striking example of a public policy impacting turn time. Designed to ease traffic on freeways at rush hour, it is ironically the cause of considerable congestion in the ports. The longest queues occur at 17:00-19:00 when trucks line up — as early as 15:30, in designated lanes with separate queue management at many terminals — to take advantage of the fee-free night shift (Figure 4). This constitutes a significant portion of the 25% exception rate (2h+ visits). Figure 4. Trucks hang back, hesitating to enter a terminal until the Traffic Mitigation Fee ends at 18:00. MTOs accommodate this by designating dedicated waiting lanes. Shortly after the TMF was introduced, an analysis of its impacts concluded that the fee worked as designed: it smoothed traffic on the I-710 freeway. What’s required now is scrutiny of its unintended consequences: a cost-benefit analysis of freeway congestion versus the truck backup outside the night gates under a couple of different TMF-structure assumptions. The TMF does not have to be an all-or-nothing proposition. A fee that ramps down over a window of say 3 hours starting at 15:00 would encourage utilization of the terminals during that low early afternoon period, while staggering some of the queuing for the night gate. If all these three solutions were implemented, a quick visual estimate based on Figure 3, basically eliminating the waves partially or entirely (mouse-over Figure 3 to see the change), suggests that a 20% turn time reduction is not a farfetched expectation. More important, it would greatly reduce the frequency of exceptional delays, improving reliability, with a significant impact on the 3-4 hour statistic. The above are just three examples of observations and recommendations that arise from METRIS turn time analysis. To be sure, they merely skim the surface of remedies. There are many other plausible proposals for efficiency improvement, from freeway reconstruction to improved communications and coordination between LMCs and MTOs, and decongestion of the port area by better management of empties. There are policy proposals too: a uniform 24×7 TMF, and 24×7 port operations. Unlike these, the three measures above, unique to San Pedro, are modest in scope, eminently supportable by analyses, non-controversial, cost-neutral, and they deliver considerable benefits in a short time-frame. A simple analysis, the variation of performance over time, can reveal causes of improvement and degradation. Figure 5 traces changes in the METRIS Performance Index, which combines “average” and worst-case metrics on a positive scale, i.e. better performance yields a higher index. Sharp and sustained turns in the curve coincide with policy changes and other events, and reflect the magnitude of impact of those changes. The figure suggests that variations in San Pedro have little to do with container volume (there is indeed a relationship, but that's an involved discussion). The downward pattern in performance is probably due to more calls by larger vessels, changes in roadability inspections and chassis policy, and slightly increased use of night gates. The impact of the strike in November-December 2012 is clear. The period of remarkable improvement in summer 2010, coinciding with the TTSG dialog, strongly suggests that turn time is positively influenced by goodwill between MTOs and LMCs (an alternate explanation is that the summer freight volume of 2010 justified terminal actions, such as additional gates and some staggering of breaks, that ceased to be warranted when traffic subsequently dropped). Clearly, all explanations are speculative until confirmed by specific analysis. The graph points out coincidence, not cause-effect. Figure 5. 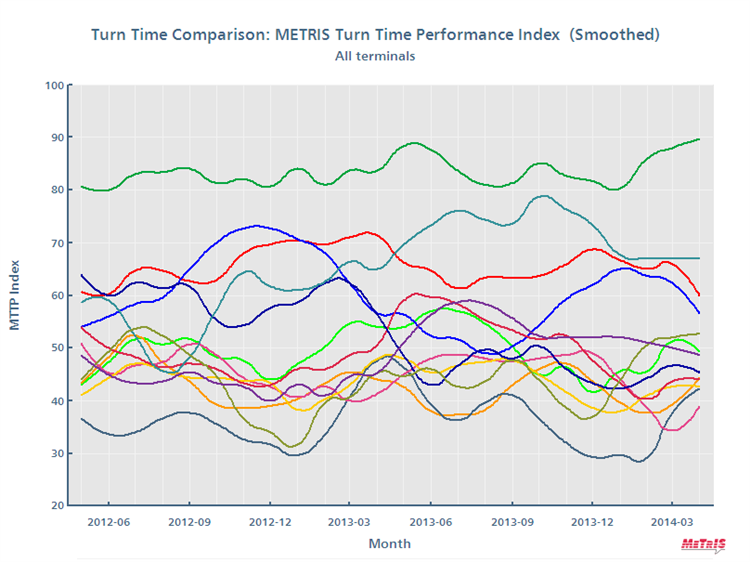 The METRIS Turn Time Performance Index shows current efficiency to be at a 4-year low. Performance appears unrelated to container volume, but there are subtle relationships. Analysis can relate changes in the index to the events that may have caused them, but this should be approached with caution. This is a brief illustration of some non-obvious intricacies of port performance, and how appropriately crafted GPS analysis can not only resolve disputes over facts, but also reveal patterns that point to root causes and prioritized solutions, without vilifying any industry segment. Policy makers — city and port executives, legislators, air quality control districts: Turn time is a key performance indicator (KPI) for strategic short- and long-horizon analyses of land side productivity, to assess a port’s performance as a whole, to examine the effects of fees, labor policies, emission controls, vessel size, automation, construction, and terminal leases, and the longitudinal impacts of changes in those variables. Port operations and security managers: As truck queues lengthen, tempers flare, and vulnerability to an external incident is elevated. Security personnel need a control-tower-like overview of port operations, with early warning when congestion is starting to develop. This requires real-time queue measurement such as METRIS LiveQ (Figure 6). Dispatchers require LiveQ to read queue length, duration and progress. Schedules and appointments are often made too far in advance to permit changes in response to current queue conditions. However, a single withdrawal from a long queue not only saves $120 in hourly wages, but also drops the number of $120,000 trucks the LMC requires in its fleet, making a persuasive case for live adjustment wherever possible. Figure 6. METRIS LiveQ provides real-time updates of queue length, dwell, speed of progress towards the gate, and trend. It uses a common schematic for all terminals, for ready comparison. This example compares two terminals, one with practically no queue, the other 1 mile long with 60 minute dwells and growing. Gate/MTO identities are masked. MTOs need weekly or monthly reports to supplement their in-terminal turn time data, to monitor and address any deterioration in service levels. BCOs need quarterly or annual performance reviews, terminal by terminal, to inform their choice of services, and to negotiate rates with steamship lines and detention rates with LMCs. LMCs, BCOs and MTOs require daily and periodic reports on episodes to document and verify detention claims. Port executives and MTOs need to draw a line in the sand, say at 4 hours. They should receive weekly reports on exceptions, and diagnose incidents in cooperation with LMCs to identify systemic problems. Animated replays of GPS data can assist. We have seen collaborative turn time research be successful and achieve consensus. We have learned important lessons from what went wrong. It takes the right motivation, leadership and stakeholders to initiate a turn time study. It takes the right analytical methodologies to anchor it, with intelligent interpretation of the results, identifying patterns, causes, and feasible recommendations. And it takes leadership, action and continued monitoring to deliver the targeted benefits. In the two JOC stories below, Pierpass president Bruce Wargo is quoted generally supporting the above proposals, subject to further research with BCOs. Fred Johring, Chair of the Harbor Trucking Association, and the trucking community also view this article favorably. These observations are drawn from years of conversations with LMCs and drivers, MTOs and ports, BCOs, union leaders, legislators, state and federal officials, consultants and academic observers. The text was modified following an interview with Bill Mongelluzzo of the Journal of Commerce, who emphasized the influence of mega-vessels in worldwide deterioration in port efficiency — a point that had not previously been made in the article.